Boris Nemtsov was murdered in February 2015 before he could finish the report on the war. 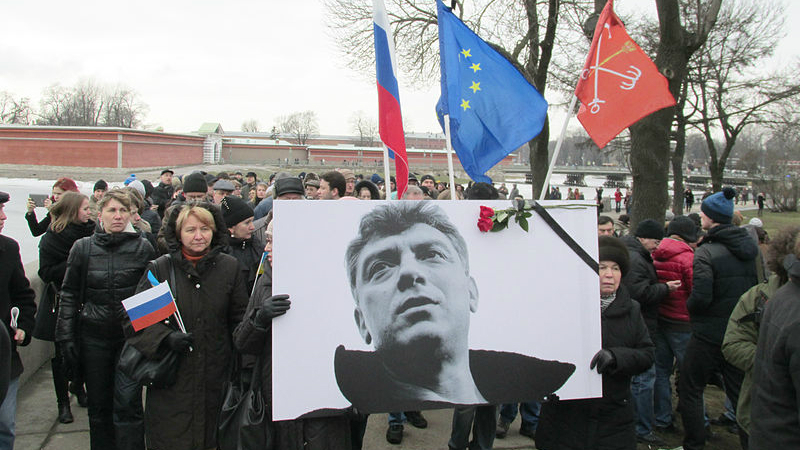 His photo is seen here at a memorial rally in St. Petersburg on March 1, 2015. Image from Wikimedia Commons. PayPal, the US-based electronic payment service, has blocked the account set up by Russian activists to collect donations for the print publication of the “Putin.War” report. Based on material gathered by the late opposition politician Boris Nemtsov, who was murdered in Moscow in February 2015, the report presents evidence of Russia's involvement in the conflict in eastern Ukraine, and asserts that at least 220 Russian soldiers have been killed in fighting in Donbass. Now it's official: PayPal has blocked the account for collecting funds to print the Putin.War report on political grounds. [Excerpt from Paypal's email screenshot: “We've analyzed the information connected to the account and we regret to inform you that the limitations on the account cannot be removed at present. This is connected to the fact that today PayPal does not offer the opportunity to use its system for collecting funds to finance the activities of political parties or for political aims in Russia.”]. In a comment to Russian news website RBC, a PayPal spokesperson said Russian users were not allowed to collect funds for political parties or projects in Russia because of the “complications of implementing the applicable control procedures.” The spokesperson did not specify how PayPal determined that the money from this particular account was intended to fund a “political project.” Yandex.Money, the Russian electronic payment service that the activists also use to collect donations, told RBC they had no issues with the project, since Russian law allows citizens to raise funds for printing books. Internet users in Russia speculate that PayPal may have caved to pressure from the Russian authorities simply because it did not want to lose its business in the country. Well PP (PayPal) just doesn't want to leave Russia. PayPal wasn't alone in this. Prior to their decision, 14 different printing houses refused to print the Russian opposition's report citing “the situation in the country.” One printing house agreed to print did so on conditions of anonymity. PayPal has blocked accounts that could be deemed political in Russia before: in May 2014 the accounts of RosUznik, a human rights organization advocating for the rights of Bolotnaya square protest prisoners, were blocked by PayPal and Qiwi, another e-payment service. At the time, PayPal cited “security concerns” as the main reason for blocking the account. All the while, Russian-supported separatists in the self-proclaimed Donetsk and Luhansk People's Republics continue to use electronic payment systems for collecting donations to fund their activities. On May 12, Ukraine's State Security Service announced they were able to expose and block 17 accounts connected to DPR/LNR, although they did not specify which service the accounts belonged to, saying only that they cooperated closely with an “international electronic payment system” to find and block the accounts. Although this was touted as a success, Ukraine's civic hackers led by Eugene Dokukin report they have been blocking separatist accounts on various e-payment systems for many months, and claim they were able to block over 200 “terrorist” accounts since June 2014 on systems like WebMoney, Yandex.Money, PayPal, and others. PayPal's message to “Putin.War” account holders explicitly states that they don't offer support for financing political activity “in Russia.” So it is unclear if the same rules apply to PayPal accounts registered in other countries. PayPal's current Acceptable Use Policy (both its US and international version) does not mention collecting funds for political parties or political aims among restricted or unacceptable activities. Paypal currently accepts transactions from many local political parties in the USA. In the past, I have seen sites seeking contributions for Presidential candidates using PayPal. What is the problem here? So free speech, human rights, and an illegal invasion mean nothing. PayPal’s response in itself was political activity within Russia. What a crock. Putin truly runs the actual fascist state. He accuses others of what HE actually does himself. Pity the Russian people for allowing this.